Vehicle wraps are quickly becoming a popular way to advertise your business, due to their high level of customization and visibility. 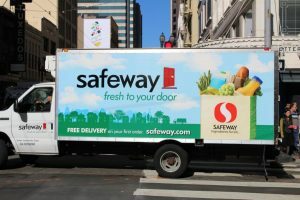 While many businesses have already invested in eye-catching, protective car wraps or truck wraps, trailer wraps represent another opportunity to expand your marketing reach even further. Trailer wraps are a great way to promote your brand on the go, whether you have a fleet of semis or a single box trailer that you use for business. Semi trucks are an unavoidable part of our day to day lives. If you travel anywhere, you are bound to see them making deliveries to businesses or transporting goods on the interstate. Most semi trailers are relatively bare, with only their company name or brand on them, representing a substantial missed marketing opportunity. Semi Truck Trailers provide you with 20-40 feet of uninterrupted marketing space that can be transported thousands of miles in a single year. 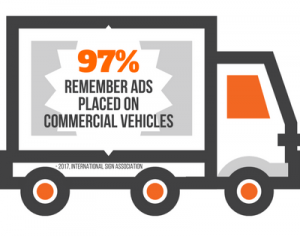 With that many eyes and that level of visibility, you are practically guaranteed to make a positive return on your trailer wrap investment. 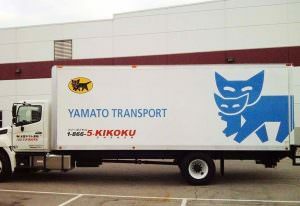 Semi truck wraps can be completely customized to your business needs, brand, and marketing message. This means that we can take any image you like, any message you want to share with the world, and turn it into an attractive, giant traveling sign promoting your business and brand. If you a general contractor, repair specialist, or landscaper that uses a box-style trailer for your business, we can create attractive, professional box trailer wraps that promote your brand and services. These attractive, polished wraps are created exactly to your specifications, including any images, text, or logos you would like to promote. We can assist with creating an attractive layout that complements your trailer and has proper positioning and size of your elements to ensure they won’t be missed. We will not only wrap your trailer, but we will also create a completely cohesive look that will compliment your trailer and work truck wrap for the ultimate professional look that is sure to impress clients. We will not only wrap your trailer; we can create a completely cohesive look by wrapping your trucks, lawnmowers, cars, or any other vehicles in your fleet. Add matching yard signs and business signs for a complete branding experience that is the ultimate in professionalism. Our staff of design experts will work with you to come up with a full wrap or partial wrap for your trailer, subject to your needs, design ideas, and budget. We can work off of a design you have already created and confirm that it will be suitable for use on your trailer, or we can create an entire design for you from scratch. The amount of coverage, size of the elements, and colors, fonts, and styles are all completely up to you, but our designers will make recommendations to ensure visibility and maximum impact is obtained. 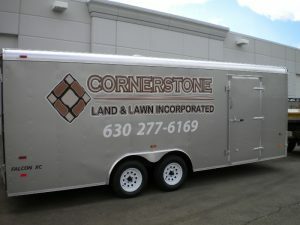 We can build a whole wrap to overlay all visible sides of your trailer or create spot graphics for branding. Our large-format wraps will let you turn your trailer into what is essentially a giant, mobile billboard that spreads your message everywhere your fleet goes. Whether you are looking for a complete wrap, or just need to add text to your trailer, we can help. Our custom sign team can create the vinyl lettering you need to add your business name, corporate message, or required DOT information for legal compliance. You have the freedom to choose from a wide variety of colors, fonts, and styles for an attractive, cohesive finish that complements your existing branding. Not only will we craft sophisticated graphics for trailers, but we can also give your entire fleet a make-over! Whether you have one vehicle or dozens, we can create cohesive vehicle wraps for work trucks, cars, vans, trailers, boats, RV’s, ATV’s, and more so that your branding is visible by land or sea. Our graphic designers can tweak your design to fit any of these vehicle types in an attractive way, creating a consistent brand image wherever your fleet may be seen. Our dedicated vehicle wrap staff is trained in trailer wrap design, manufacturing, and installation. We handle every step of the process, providing you with draft layouts so you can see the design in action prior to production, complete manufacturing of all components, as well as guaranteed installation, maintenance, and repairs if needed. Our goal is to create a long-term marketing product for you that looks great for many years to come, and acts as a reminder to you that we are here for you the next time you need assistance with signage or branding for your business! 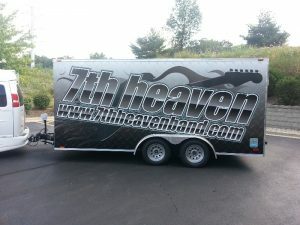 We provide attractive, durable trailer wraps that promote your business, build customer confidence, and make you look like the professional you are! Call Irving Signs & Wraps today at (972) 325-0922 for a Free Consultation with a Trailer Wrap Specialist!